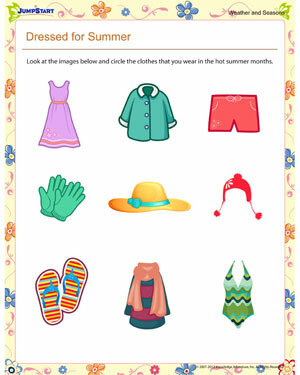 JumpStart’s ‘Dressed for Summer’ is a fun and colorful weather and seasons worksheet for kindergarten. Here, kindergarteners will identify summer wear from a bunch of clothes and circle the right choices. Download this free printable seasons worksheet to give the young ones in kindergarten their first introduction to the summer season! Find more such fun weather and seasons worksheets for kids at JumpStart today!